· Built-in LEDs inside the entire housing. · Ready to fly: with interference-free 2.4Ghz radio, LiPo battery and USB charger. · The main novelties are that they have incorporated a BAROMETER system to control altitude (AIR PRESSURE ALtitude HOLD MODE): pressing a button the drone will remain at the same height. And the other system to be highlighted is the SELF-TAKE / LANDING BUTTON: pressing a button the drone will take off or land the solo. Apart from these new functions, the Wltoys V666N drone continues to incorporate Headless mode and One Key Return functions. Without forgetting also the 4 flight modes selectable 40%, 60%, 80% or 100% for the most experienced. 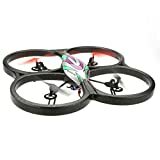 It incorporates a 720p HD camera and a 5.8Ghz FPV system with its 4.3 LCD monitor, so you can observe in real time on the LCD screen what the Drone is recording and capture the best images. 4GB memory card with your reader to transfer photos and videos to your computer FPV system: video transmitter, video receiver and screen easily attachable to the station. LED lights for easy orientation and night flight. Flight: Up/Down, Left/Right, Front/Back, Side Scroll on both sides. Incredible stability and smoothness of movements thanks to its 3 gyroscopes and 3 accelerometers with 6 axes of stabilization. Perfect for outdoor flight. Allows you to perform loopings and casks. Battery: 7.4V 1200mAh LiPo (included) 4 speed modes available: 30%, 60%, 80% and 100%. This makes it perfect for pilots of all levels of experience. Stabilization system on the 6 axes. Flight time: about 10 minutes. Range of the station: 100-150 meters. UFO dimensions: 55 x 55 x 5cm. Very light and super shock resistant thanks to the durable protective foam. Includes spare parts propellers.